Today is a big day at Royal Panda! The latest video slot from the provider NetEnt has reached the casino and this will be celebrated in the best possible way. 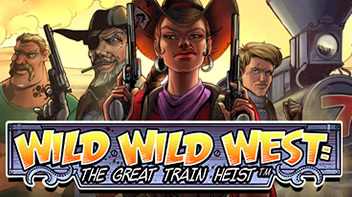 From today, the 23rd of February, until the 1st of March you will be able to log in at Royal Panda every day in order to claim either free spins or more valuable Royal Spins on the brand new video slots called Wild Wild West: The Great Train Heist. We can assure you – you’re in for a treat! This casino game offers a really cool theme with fantastic graphics, music and bonus features such as free spins and a pick and click game. Make sure to visit Royal Panda from today if you want to claim up to 175 free spins or Royal Spins on Wild Wild West. It’s super easy to join the promotion at Royal Panda during the upcoming seven days. Just make a deposit every day if you want all of the spins. Of course these spins will be available on the new slot Wild Wild West: The Great Train Heist at Royal Panda! The campaign starts today and will continue until the 1st of March. You can get Royal Spins worth up to £350. You can choose between depositing £200 before 23:59 if you want 25 Royal Spins the next day or if you’d rather want to deposit £25 before 23:59 and get 25 free spins instead. This offers is, like we mentioned before, available every day. The Royal Spins are worth £2 per spin! Keep in mind that wagering requirements apply on your winnings and it’s set to 35 times. Since tomorrow is Friday we want to give you a heads up about the reload bonus you can claim if you want a little extra to play with. You can get 50% extra bonus at Royal Panda every Friday up to none the less but £150! This offer is only available on Friday’s until 23:59. The wager requirements is also 35 times and you will have to fulfill this in order to be able to make a withdrawal from your account at Royal Panda. Not a member yet? Don’t wait any longer – sign up today and grab you welcome bonus with free spins on Starburst and a deposit bonus up to £100 right away!